In early February 2004, when I realized that Prime Minister Ariel Sharon was indeed serious about pulling Israeli troops and civilians from Gaza, I warned against this on the grounds that "Palestinian Arabs will see a pullback signaling that Israel is weak, appeasing, and vulnerable. Far from showing gratitude, they will make greater demands." From time to time, I will here assess that prediction by providing quotes in one direction or the other – gratitude or greater demands. We tried, through our attacks, to create fragmentation and dissention within Israeli society, and the left-wing's reaction was proof that this was indeed the right approach. When we heard about the "Pilots' Letter" [from 27 Israel Air Force pilots who refused to take part in bombing missions against Palestinian terrorists], and the elite soldiers who refused to serve [in the West Bank and Gaza], it strengthened those in our camp who promoted the idea of suicide bombers.... The disengagement from Gaza is proof of our victory. The fact is that Sharon is willing to withdraw unconditionally, and is essentially raising a white flag and retreating. Only by force can we teach the other side what to do. Ahmed al-Bahar, a top Hamas leader in Gaza: As reported by Khaled Abu Toameh in the Jerusalem Post, Bahar sees Israel's decision to withdraw from Gaza as a great victory for the Palestinians. The painful and qualitative blows which the Palestinian resistance dealt to the Jews and their soldiers over the past four-and-a-half years led to the decision to withdraw from the Gaza Strip. The suicide attacks and the [booby-trapped] underground tunnels have taken their tolls on the Jews, both psychologically and economically, in addition to the high number of casualties. … All indications show that since its establishment, Israel has never been in such a state of retreat and weakness as it is today following more than four years of the intifada. Hamas's heroic attacks exposed the weakness and volatility of the impotent Zionist security establishment. The withdrawal marks the end of the Zionist dream and is a sign of the moral and psychological decline of the Jewish state. We believe that the resistance is the only way to pressure the Jews. Very simply, nobody can deny that if Israel is going to leave the Gaza Strip and part of the West Bank, that was because of the intifada, because of the armed struggle, because of the big sacrifices of Hamas for this goal. It was not because of negotiations, or the goodwill of Israel, or the Americans or Europeans." Israel National News has collected quite a selection of quotes by Israeli leftists worried about the Palestinian reaction to Sharon's planned Gaza withdrawal. Here are some of them. If the disengagement does not lead to an immediate permanent status arrangement, it will bring a catastrophe upon both Israelis and Palestinians... It is liable to bring a renewal of violence [that] is liable to bring down the moderate Palestinian leadership... There is a concrete danger that following the disengagement, the violence will greatly increase in [Judea and Samaria] in order to achieve the same thing [i.e., withdrawal - ed.] as was achieved in Gaza... A retreat from Gaza with nothing in return and with no agreement will strengthen Hamas. A unilateral retreat perpetuates Israel's image as a country that runs away under pressure... In Fatah and Hamas, they will assume that they must prepare for their third intifada - this time in [Judea and Samaria]... If we continue these unilateral steps, we will find ourselves establishing an enemy Palestinian state. Retreat without getting anything in return is liable to be interpreted by some of the Palestinians as surrender. The plan is likely to strengthen extremist forces in the Palestinians society... There is a high chance that shortly after the disengagement, the violence will be renewed. There is no chance that the disengagement will guarantee long-term stability. The plan as it stands can only lead to a renewal of terrorism... If there is no quick progress from the disengagement to a comprehensive retreat, [this will lead to] the one-state solution - bringing to an end of the Zionist dream, and the Jewish State will be lost. Opinion polls conducted by [Khalil] Shikaki's Palestinian Center for Policy Survey and Resarch over the past two years have consistently indicated that three-quarters of the Palestinian public views the disengagement as a victory for violence. We won't disrupt the Israeli withdrawal, let them get out of here and go to hell. The problem will be afterwards, because in the hearts of every Palestinian, the liberation of Gaza must be accompanied by the liberation of Jerusalem and the West Bank. They are going to leave [Gaza], not because this is a gift from Israel. This is because they failed to confront our people, so don't describe their withdrawal from here...as a gift for the Palestinians. This is because they are defeated here. a majority of the Palestinian public sees Israel's decision to withdraw as a sign of the victory of the intifada has long been known. It is hard to argue with this. Years of a peace process and negotiations between the Palestinians and Israeli governments, including Likud governments, have not led to Israeli withdrawal from Gaza. The idea of withdrawal entered the mind of Prime Minister Ariel Sharon only after suicide attacks, Qassam rockets and mortars. Even if these attacks were not the reason why Sharon came up with the idea of disengagement, the Palestinians are certain that that is the case, and this has reinforced their belief that Israel only understands the language of terror attacks and violence. This belief will now become an absolute certainty - if Israel withdraws unilaterally under fire. A drive around the hilltop villages of Lebanon's south provides a clear and powerful warning: Any Israeli pullback carried out unilaterally - and not as part of a negotiated deal with the Palestinians - will undercut Israel's security and the shaky future of the peace process itself. The prestige of "expelling" Israel has also made Hezbollah's political wing one of the most powerful players in Lebanese politics, more potent than Amal, the more moderate Shiite party. Hezbollah will soon get seats in the new cabinet. What are the lessons from this South Lebanon tale for the Gaza pullout? A pullout from Gaza that is carried out unilaterally and not as part of broader peace negotiations will backfire. It will lead Palestinians to the conclusion that the best way to end Israeli occupation is not by negotiations - but by force. Which Palestinian faction gets to claim victory over Israel in Gaza? That's the key question as the withdrawal looms. in print shops, flag factories and back alley sewing workshops. The Palestinian Authority has commissioned tens of thousands of national flags as well as mugs, bumper stickers and posters with the slogan "Today Gaza, tomorrow the West Bank and Jerusalem"—props for planned mass celebrations meant to portray the pullout as an achievement of the Abbas government. Hamas is striking back, preparing for military-style victory parades. Hamas supporters are sewing thousands of martial uniforms and flags in the group's trademark Islamic green and activists are buying up privately owned jeeps and pickup trucks to lead the marches. is spending $1.7 million on withdrawal celebrations. It has ordered tens of thousands of Palestinian flags, from small pennants to two-story banners, that are being sewn in small workshops across Gaza. A Gaza City flag shop is sewing about 200,000 Palestinian flags. "They want the whole country to be carrying Palestinian flags," said the owner, Tareq Abu Daya. For the victory rallies, the government will give away to its supporters 128,000 pairs of blue jeans along with white T-shirts, either with Palestinian flags or pictures of the late Yasser Arafat. Posters, caps, mugs and bumper stickers are being printed with slogans. Khaled Mashaal, a Hamas leader, told Al-Hayat newspaper that Israel's withdrawal from Gaza marks "the first step on the way to complete liberation" of Palestine (i.e., complete destruction of Israel) and "the beginning of the end for the Zionist program in the region." In contrast to Prime Minister Ariel Sharon, who intends the Gaza exit "to be the first and last," Mashaal said Hamas sees the withdrawal as the "first step for full liberation and achieving all of our legitimate rights. Today Gaza and tomorrow the West Bank and later every inch of the land." As such, Mashaal considers the withdrawal from Gaza is an "historic turning point in the Arab-Israeli conflict." In the most aggressive Palestinian statement to date, a video was released today with a statement by a person whom specialists confirm is Mohammed Deif, a Hamas arch-terrorist leader. Addressing the Israelis just after the completion of their withdrawal from Gaza, he said: "You are leaving Gaza today in shame. Today you are leaving hell. But we promise you that tomorrow all Palestine will be hell for you, God willing." He also praised the jihad against Israel and called for attacks to continue until Israel is destroyed. From the Palestinian perspective, most significant is that this unilateral withdrawal by Israel was brought on by the "victory" in the "resistance" - the Palestinian Authority euphemism for terror. Accordingly, the Palestinians have rarely used the Arabic equivalent of Ariel Sharon's term, "disengagement," but rather, refer to Israel's actions with various other words: insikhab, which means either "withdrawal" or "retreat;" tard, meaning "expulsion;" or dakhr and indikhar, which mean both "expulsion" and "defeat." Terror can work either independently or as part of a cycle with diplomacy: "The gun sows and diplomacy reaps"
And then, in defiance of expectations, the Boston Globe publishes an article by Thanassis Cambanis, "Some shunning the Palestinian hard stance," that makes quite the opposite claim, that Palestinians do understand the realities of Israeli power. After his 12-year-old son died in a hail of bullets in 2000, Jamal al-Dura became the public face of Palestinian suffering as the second intifadah began. He traveled across the Arab world, standing as a symbol of perceived Israeli brutality and growing wealthy from the largesse showered upon him. Nearly five years later, however, Dura says he has tired of mouthing the counterproductive mottos of Palestinian hard-liners. Instead, with Israel's withdrawal from the Gaza Strip last month, he has turned to building a grand new home for his eight surviving children and he has forbidden his eldest son from joining any militant movement, at least until he finishes university. "One martyr from this family is enough," Dura, 43, said at his home in Bureij. He's only the most famous of a minority of Gaza Palestinians who are rejecting the all-encompassing culture of intifadah, jihad, and martyrdom that has turned camps like Bureij and Jabaliya into locomotives of the Palestinian militant factions. These Palestinians believe Gaza has reaped few results from decades of war and militia leadership; now, these disenchanted Palestinians say, it's time to replace calls to arms and total victory over Israel with real improvements for Palestinians, like better education, housing, and jobs. Cambanis provides some good quotes. "Look at them," said Jamal abu Nasser, 52, the owner of a taxi fleet in Jabaliya, as hundreds of youth wearing Hamas baseball caps and headbands entered the mosque near his business and prepared for a militia rally. "They act like it's some kind of wedding." Abu Nasser calls the Palestinian leaders "corrupt, delusional militants" and states out loud that "We cannot defeat Israel. Jerusalem will never be a Palestinian capital. This is empty talk," Abu Nasser said. "Most people don't understand this reality." Mohammed Ahmed Moussa, 62, a grocer in Jabaliya, recites the usual blather: "I am happy, but my joy is not complete, because Israel still controls the sea, the sky and the crossings." He goes on, however: "Let's be frank. If Israel didn't want to leave Gaza, no one could have forced them out. Those who claim the rockets and attacks made them leave are kidding themselves." Hamas leader Khaled Mashal infused this argument with colorful rhetoric during a "victory speech" in Beirut on August 17, the first day of the evacuation of the settlers of Gush Katif. Israel, he explained, a nation that was constantly committed to territorial expansion and the colonization of newly conquered land from the tip of the Sinai peninsula up to the peaks of Mount Lebanon, has sunk into a shrinking process, divesting itself of the assets it seized and erasing its settlements. According to Mashal, it's a one-way, irreversible trend. "It took time," he declared, "but that is now the direction." Palestinian history professor Isam Adwan is already doing the calculations for the Islamic Jihad. The Soviet Union, he notes, rose and fell within a single lifetime (1917-1990) and he promises the same fate for Israel. Israel's power reached its peak in 1967 and has been on the wane ever since - a deterioration, Adwan believes, that will lead to its total withering no later than 2022, when the state will be 74 years old, more or less the same age as the Communist empire when it expired. Till then, he says, Israel will exist on vitamin supplements and with the help of its American caregivers. This prediction elaborates the slogans that Hizballah leader Hassan Nasrallah often repeats about Israel being like a spider's web, which gets ever thinner the more it spreads, and echoes the prophecies of the late Hamas founder Sheikh Ahmed Yassin, who forecast the year of Israel's demise as 2025. The implication is that there is no necessity for the Palestinians and their partners to storm Israel. They needn't go for an all-out, decisive confrontation. All they have to do is carry out a stubborn and grinding campaign of attrition. 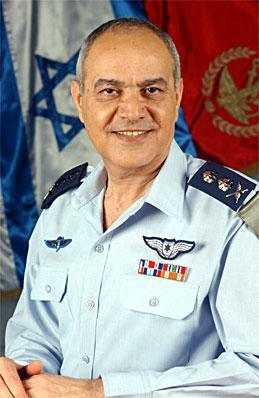 Lieutenant-General Dan Halutz, Israeli chief of staff.